Ayurvedic herbal master piece ! Ayurvedic medecine is one of the oldest and most holistic systems of natural medicine. Of the hundreds of formulations described in ancient ayurvedic texts, Amrit Kalash® is the most prized, classified as a rasayana - a preparation that promotes health, longevity and higher states of consciousness. 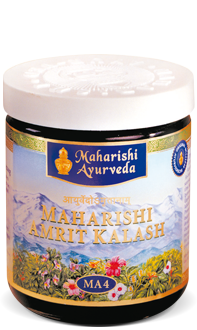 Amrit Kalash® is without doubt the most widely-studied ayurvedic formulation available. • The forty herbs, roots and sun-ripened fruits which make up Amrit Kalash® are harvested and handpicked from over fourteen areas. • The traditional recipe involves 250 laborious production stages at low temperature, and requires almost 11kg of raw material for each jar - that’s a ratio of 22 to 1! • Only whole, contaminant-free herbs are handpicked at precisely the right stage of maturity from virgin forests and Himalayan mountainsides, by more than 6000 specially-trained personnel. • The manufacturing process is carried out in accordance with ancient texts but benefits from the latest technology in the only ISO 90001-certified ayurvedic laboratory. Systematic scientific testing ensures the final product meets the most rigorous quality standards. • Comprising natural ingredients, partly from certified-organic sources, and free from artificial preservatives, Amrit Kalash® provides a potent blend that complements and boosts the all-round, optimal health benefits of a fruit- and vegetable-rich diet. Among its most common herbs and fruits are Amla, cinnamon, cardamom, turmeric, sandalwood, long pepper, Cobra’s saffron, liquorice, Gotu kola and Tribulus terrestris. • Amrit Kalash® is a renowned formulation which has been the subject of numerous international scientific studies and the herbs it contains have themselves generated several thousand publications. • Amrit Kalash® is recommended and prescribed by thousands of doctors and herbalists, including preeminent ayurvedic experts. • In fact, scientific studies on Amrit Kalash® have demonstrated that this herb and plant complex has probably the highest concentration of water- and fat-soluble antioxidants, acting synergistically on every cell in the body. This synergy guarantees intense, stable and long-lasting effects on general health. • This speciality complex could thus be called “the large spectrum antioxidant”, effective against the majority of free radicals. • As scientific studies have reported no evidence of toxicity, Amrit Kalash® can be taken by the whole family alongside a healthy, varied and balanced diet, to restore or maintain optimal well-being. Along with Amrit Kalash®, other renowned Ayurvedic formulations are now available in nutritional supplement form. Triphala Internal Cleanser, for example, combines three fruits with detoxifying properties, while curcumin is a beneficial active principle found in the plant Curcuma longa. In addition to these Ayurvedic remedies, you may also be interested in products from traditional Japanese medicine such as shiitake mushroom and the algae Ecklonia cava. Amla (Emblica officinalis – fruit), Cinnamon (Cinnamomum zeylanicum - bark), Cardamom (Elettaria cardamomum – fruit), Turmeric (Curcuma longa - rhizome), Long pepper (Piper longum – fruit), White sandalwood (Santalum album), Cobra’s saffron (Mesua ferrea – fruit), Butterfly pea (Embelia ribes – fruit), Liquorice (Glycyrrhiza glabra – root), Gotu kola (Centella asiatica – leaf), Tribulus terrestris – fruit, Benal quince (Aegle marmelos – root), Cashmere bark (Gmelina arborea), Giant potato (Ipomoea digitata – rhizome), Indian kudzu (Pueraria tuberosa – rhizome), Shatavari (asparagus racemosus – root), Solomon’s seal (Polygonatum verticillatum – racine), Indian nightshade (Solanum indicum – whole plant), Yellow snake tree (Stereospermum suaveolens – bark), Terminalia chebula – fruit, Nut grass (Cyperus rotundus – root), Cyperus scariosus - root, Convolvulus pluricaulis – whole plant, Oroxylum indicum - bark, Thatch grass (Saccharum spontaneum – root), Eragrostis cynosuroides – root, Desmodium gangeticum – whole plant, Uraria picta – whole plant, Yellow-berried nightshade (Solanum xanthocarpum – whole plant), Large caltrops (Pedalium murex – fruit), Phaseolus trilobus – whole plant, Teramnus labialis – whole plant, Clerodendrum phlomidis - bark, Leptadenia reticulata - root, Boerhavia diffusa – whole plant, Sida cordifolia – whole plant. Amrit Kalash® is 100% natural and contains no preservatives. Take half a table spoon (10 g) around breakfast and bedtime. May be taken plain, with a snack, light breakfast or mixed with warm milk, water or juice.